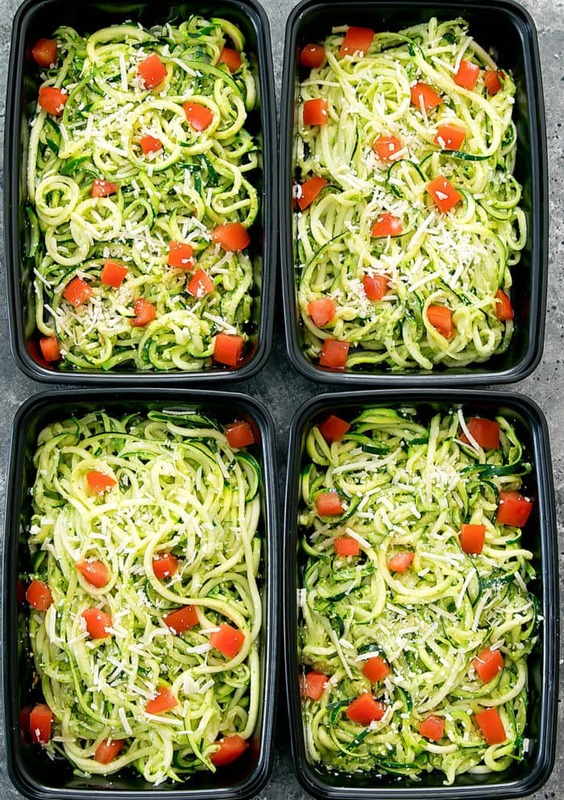 Pesto Zucchini Noodles are an easy and light meal that can be made ahead of time for your weekly meal prep. Now that it is officially spring, I’ve become a little bit obsessed with all things green. We’ve been eating a lot of avocados, zucchini noodles and making pesto with the herbs in my garden. 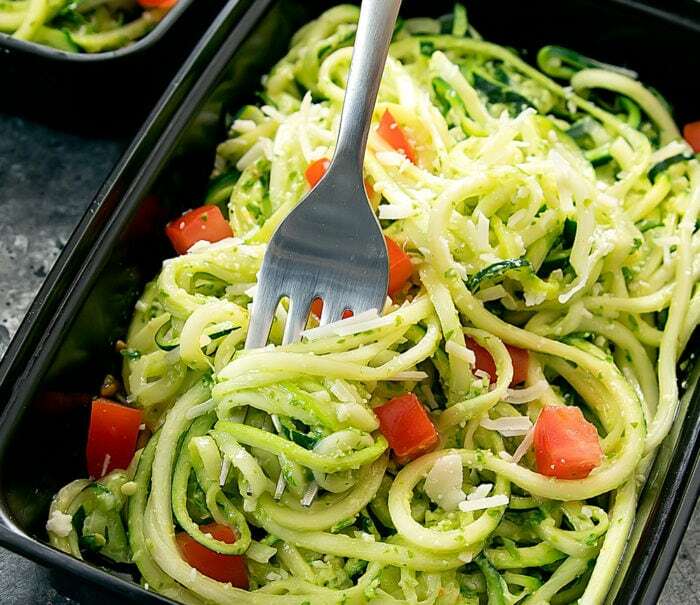 These zucchini noodles are tossed in a fresh pesto sauce. It seems like such a simple dish but it’s very flavorful. You can also add some protein in with the zucchini as well but I try to keep things lighter for lunch to avoid food coma. If you’re using basil based pesto, the pesto will oxidize and turn brown when it’s heated, so you’re meals won’t be the prettiest. If you want to maintain the green color, you can make your pesto out of parsley, kale or carrot top greens. I’ve made pesto out of all of them before and it still tastes delicious. To preserve the green color of the pesto, I usually use parsley or kale, but you an use basil if you prefer. Just know that your pesto will brown. I usually briefly reheat the noodles in the microwave but sometimes I’ll just eat them cold or room temperature in the summer. 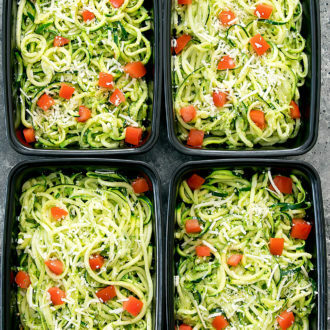 An easy and flavorful zucchini noodle dish that can be made ahead of time for your weekly meal prep. In a large skillet or wok, add oil. Bring pan to medium high heat. Add in the zucchini and cook until tender but still crispy. Place zucchini into a colander to strain out all the water. Set aside. 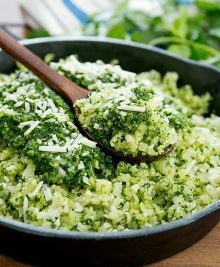 To make the pesto, add parsley, garlic, cheese and nuts to food processor. Pulse on high speed until everything is finely chopped. 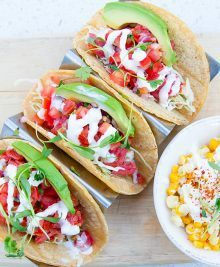 Set food processor to low speed and gradually stream in the oil and lemon juice while the food processor is still running, until the sauce becomes smooth and creamy. Start with 1/3 cup olive oil and add more if needed. Taste and add salt and pepper if needed. 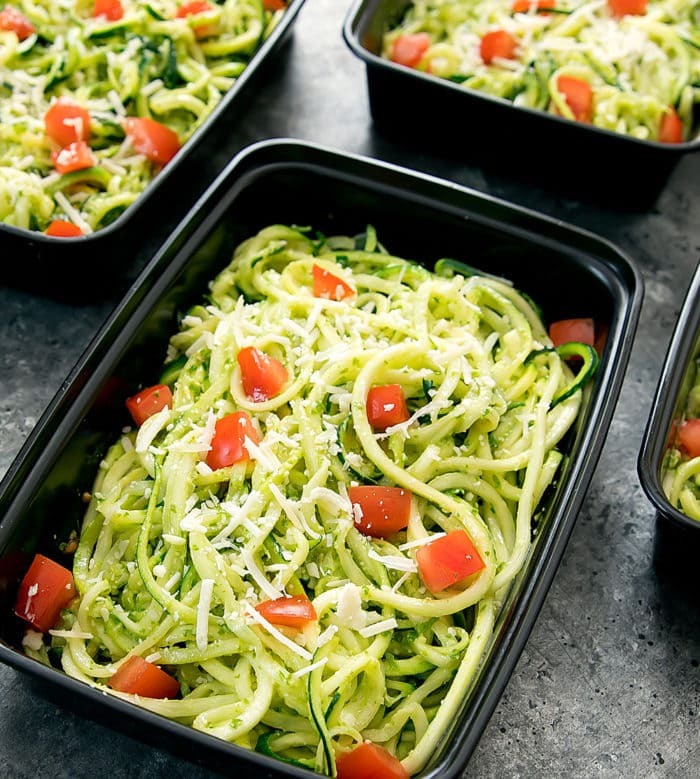 Toss zucchini in pesto. You do not need to use the entire amount of pesto. Just add enough for your own personal preference. Toss in tomatoes. Divide into meal prep containers. Garnish with parmesan cheese if desired. I usually briefly reheat the noodles in the microwave but sometimes I'll just eat them cold or room temperature in the summer. Parsley, walnuts and 1/3 cup of extra virgin olive oil are included in the nutrition estimate.